Introduce bohemian style into your boudoir with this gorgeous bedding set. Both the pillowcases and the quilt cover feature tassel trims and a narrow crochet band, which is beautifully textural and a charming visual. Layer extra cushions on top for relaxing comfort. The Blush Boho Tassels Linen Blend Quilt Cover Set is a Contemporary style product. Contemporary style bridges the gap between traditional and modern. Pieces feature simple and clean lines with smooth surfaces without any carving or adornment. You can shop for more Contemporary Quilt Covers in the Bed & Bath section of our site. 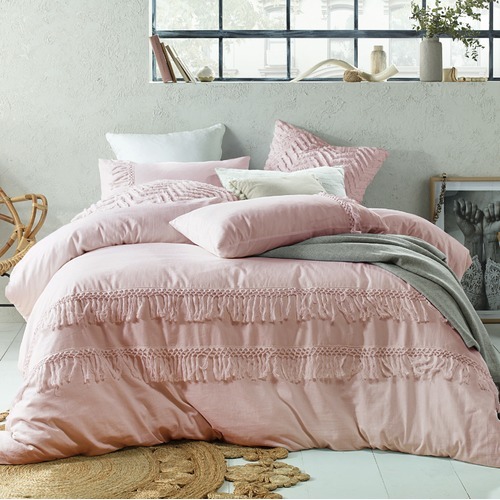 When you buy a Blush Boho Tassels Linen Blend Quilt Cover Set online from Temple & Webster in Australia, we make it as easy as possible for you to find out when your product will be delivered to your home in Melbourne, Sydney or any major city. You can check on a delivery estimate for the Accessorize Part #: 685 here. If you have any questions about your purchase or any other Quilt Covers product for sale our customer service representatives are available to help.Whether you just want to buy a Blush Boho Tassels Linen Blend Quilt Cover Set or shop for your entire home, Temple & Webster has a zillion things home. Very pleased with the quilt cover set, although a bit disappointed with the thickness. Colour great and matches my grey carpet nicely. Delivery time was exceptional and being continually updated with the progress was very helpful. Overall, really can't complain about anything. Not terrible but didn’t meet expectations. The fabric is thin & picks up all kinds of lint so it never looks clean. Only used once & then bought another brands quilt & relegated this to the linen closet. The combination of linen/ cotton is soft and cool to sleep under,colour exactly like the picture,however I always wash bedding and new clothes prior to use and even when I washed this inside out on a gentle wash and low spin,line dry on a windy day the tassels become tangled and it definitely needs ironing,unless you like the crushed look of linen.I found it easy to separate the tassels by hand and then I brushed them with a clothes brush. Lovely quality. Looks and feels great. So happy with my purchase! Looked quite worn and shabby after first wash, gave it away. My first disappointment from .Temple and .Webster. Beautiful color but poor quality fabric,. I loved the look of this Donna cover, I unpacked it, ironed it and put it on the bed - looked beautiful BUT due to the very poor quality fabric, the Donna cover was sooo badly creases after three nights I decided to take the Donna cover off the bed. It looked like a creased up rag sadly. Lovely quality. Tassels make the look just a little different. Washed up beautifully. I bought both these items for my Granddaughters 21st, she loved them and they looked beautiful on her bed.